It's unusual to find a Silicon Valley CEO call for more government regulation. 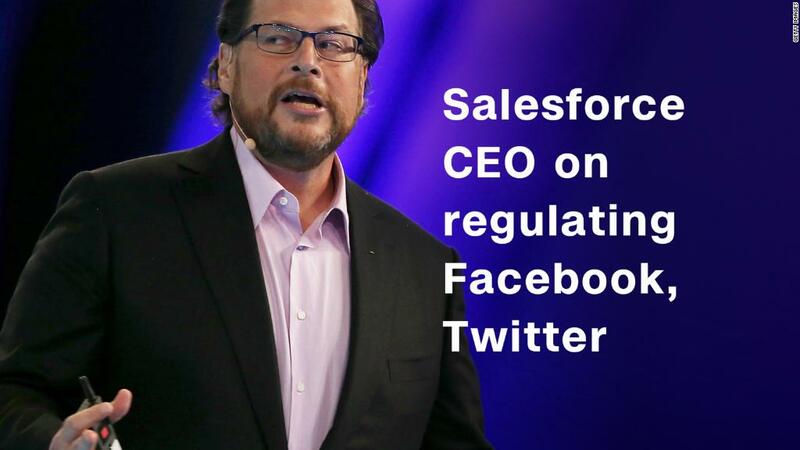 Salesforce head Marc Benioff is all for it — at least for Facebook, Twitter and Google. "Do these companies need more regulation? They probably do," Benioff said in a new podcast episode of CNN's Boss Files with Poppy Harlow. Lawyers for the three companies testified in front of Congress this month about Russian interference in the U.S. presidential election. They admitted they were used to spread Russian propaganda through advertisements and bots. Currently, political advertising online isn't regulated like it is for broadcast television. It's not just a one-off issue of election meddling for Benioff, but part of a larger question about paying closer attention to the way new technologies can shape our world. "We need to decide what kind of a society that we're gonna have going forward," said Benioff. "You can see that what's happening with the social networks and the elections. You know where this technology really got out of control, that even they didn't know what was happening." He added: "A lot of these revelations are surprising to them, that their technology was manipulated and used in this way. In the same way, we have to look at how these technologies are being used by everyone." 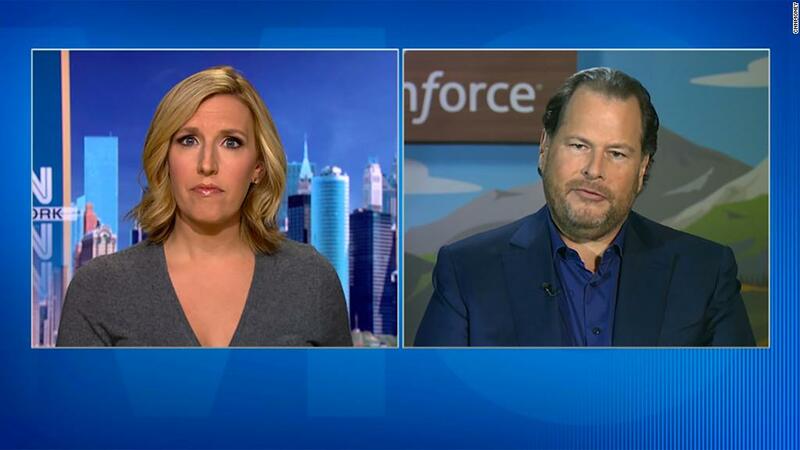 Benioff sat down to talk to Harlow during last week's Dreamforce, the annual Salesforce conference in downtown San Francisco. Regulation isn't the only controversial Silicon Valley issue Benioff weighed in on. He said he also wants the government to allow corporations to repatriate foreign revenue stuck overseas. American corporations have trillions of dollars stuck outside the U.S. where they're able to defer paying taxes. Repatriating those funds would allow companies to bring back the money at a lower tax rate. "I do think repatriation would be a very healthy thing for our economy," said Benioff. "I think it's a very healthy thing for the government because the government should be able to ring the register as that money is coming back." He recommends letting the government take 15% to 20% in taxes on the money, and restrict how companies can use the cash. Instead of letting them use it for stock paybacks or dividend payments to shareholders, the U.S. could add restrictions so it's invested in things like hiring locally. "I think that's a great opportunity when they bring this cash back to really focus on growing these companies right here in the United States, I think that's a huge opportunity," said Benioff. Benioff, like many tech CEOs, has met with President Trump. Benioff, who says he is not a Democrat or a Republican, publicly supported Hilary Clinton in last year's election. When the tech leader met with the president in March, he suggested the government invest $5 million into an apprenticeship program aimed at creating 5 million jobs by 2022. "A lot of people whose jobs are gonna basically change because of this new technology are gonna have to get retrained, and the way to do that is with a very proven model which is apprenticeships," said Benioff. Apprenticeships can offer hand-in-hand retraining for people like truck drivers, taxi drivers, farmers and other people who's positions might be made obsolete by automation or artificial intelligence, said Benioff. The government already has some programs like Apprenticeship Now and Apprenticeship USA, but Benioff would like to see them scaled up. "We have to get ready for a future that's very different than the present moment, and that's what I'm advocating for," he said.